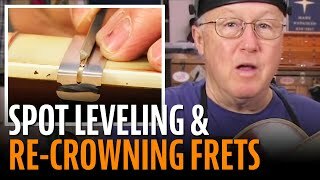 Don MacRostie shows us his methods for fingerboard binding and fretting on a Red Diamond vintage model mandolin. Erick Coleman's got a neck to fix, including a broken peghead. One thing leads to another, and it turns out the toughest job is hiding the fretboard chips left by the last repairman to work on this guitar. Dan Erlewine's been posting photos on Facebook, creating this photo story on how to convert a fretted bass to fretless. It's a Trade Secrets story and it's on Facebook too! 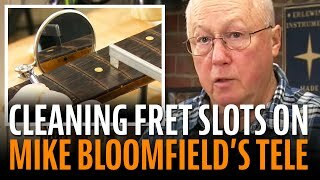 How to determine where to cut fret slots using the Dual Fret Scale Templates. Dan Erlewine's customer got a deal on eBay. Whether it was a good or a bad deal depends on how much it takes to make it playable. Dan fixes fret buzz and a warped neck, then rebuilds the truss rod nut using JB Weld repair epoxy. Erick Coleman pulls his old Strat out of mothballs and gives it a new neck. He shows what's needed to get a replacement neck ready to play. Matt Brooker has a neck with some buzzing frets. He traces the problem to some poorly seated frets and shows two ways to clamp them down. Matt shows why seating the frets is the first thing to do before taking a file to your fretboard. Dan Erlewine found a 1935 May Bell and fell in love with her. She has some fret buzz due to worn frets that are flat and wide. Dan shows how a little leveling and filing got her playing again. The rosewood fretboard on this 1963 Telecaster has some nasty chips from old fret jobs. 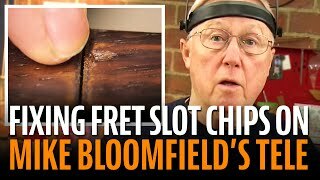 Dan Erlewine uses three methods to fix fretboard chips, including some serious surgery for the worst cases: grafting in new rosewood! The Fret Barber lets you "take a little off the sides" to adjust the width of the fret tang by removing metal from the barbs. Downloadable instructions for smoothing fret ends with Fret Beveling Files. Tips for using our fret scale rules for building and repairing guitars, mandolins, and banjos. Easily cut accurate fret slots with the Miter Box and Fret Saw. Erick Coleman's restoring a 1950s Les Paul, and returning the bound fretboard to its original condition. With small files and elbow grease, he shows how to create the fret-end "binding nibs" for that distinctive Gibson look. 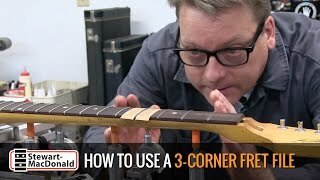 There’s a knack to using a StewMac 3-Corner Fret Dressing File, and Erick Coleman shows you what that’s about. He demonstrates the rolling motion that creates a nice rounded fret with an accurate “land” down the center. A fret hammer was one of the first lutherie tools Erick Coleman ever bought, and it's still an essential in his shop. In this issue of Trade Secrets, he shows how to use it. Overview and instructions for using the Jaws Fret Press. An overview of and instructions for using the Jaws2 Fret Press. An overview of and instructions for using the Jaws3 Fret Press. 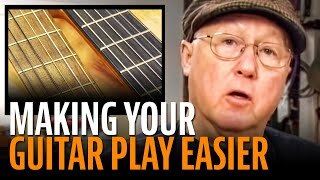 Dan Erlewine shows the steps of inspecting a customer's guitar, and gives advice on repair prices for the work required. Moneytalk: an easy repair -- until it blew up in my hands! Dan Erlewine started a simple, quick repair, but one unlucky hammer tap created a whole new problem to solve! Erick Coleman gives The Business to Rontrose Heathman's Les Paul to get it ready for a recording date with L.A. legends, The Hangmen. An explanation of the different uses of a radiused sanding block. Dan Erlewine just moved into a new shop! 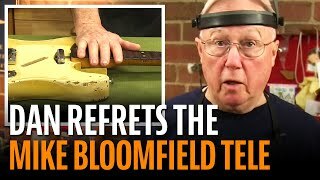 In this video he finishes work on the Mike Bloomfield Telecaster, a guitar with a lot of history. We’ve been following this guitar for several videos; now Dan wraps it up with an assist from Erick Coleman. The Mike Bloomfield Tele is back in Dan’s shop. It's in for a refret, and that means working very carefully on this historic guitar. 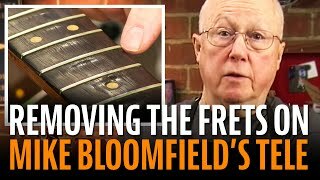 As Dan pulls all the frets, does he manage to avoid chipping the old rosewood fingerboard? Making a beginner-friendly fingerboard: Dan Erlewine’s sister-in-law is learning to play, and her guitar has rough, sharp fret ends. The fingerboard edge is also too sharp, but Dan quickly makes this guitar more beginner-friendly. 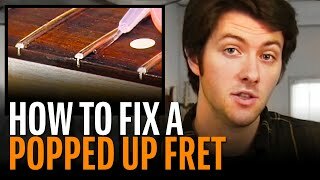 Super glue your frets for better tone! Erick Coleman shows why so many guitars need their frets fastened. Add a touch of water-thin superglue to lock down your already-installed frets, and get better tone, too! Use a Fret Setter upside down for faster fretwork! 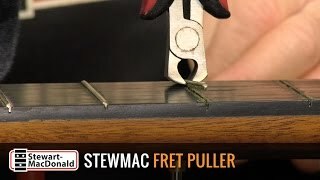 Dan Erlewine demonstrates the StewMac Fret Puller on an old classical guitar fingerboard. Years of hot dry storage caused the fret ends stick out on the sides of this banjo neck. Mark Hyatt found that it's easy to file them back into line! This week, Dan Erlewine's pumping iron (nickel steel, actually!) He's showing how to bulk up your skinny fretwire and slim down your fat fretwire. Why use a household iron on a fretboard? Erick Coleman uses his wife's clothes iron on a guitar: a simple solution to a problem fretboard. There was a load of glue and grunge under these frets. With scrapers, wipers and heat from an alcohol lamp, it’s amazing how much gunk Dan Erlewine extracted from Mike Bloomfield’s old fretboard!